Over the past decade, Android has grown manifold under Google’s guiding hand, going from Andy Rubin’s pet project to the largest-by-far mobile operating system in today’s market. The growth curve saw many pivotal moments, each marking a milestone accomplishment, but none was as significant as the launch of Android Lollipop at Google I/O last year, an accomplishment that signaled the climax of its maturation. Lollipop was a success for numerous reasons, but its most prominent feature was the metamorphosis of the platform’s visual language that it brought about. Android had been undergoing subtle but vital underlying user experience changes from the launch of Honeycomb, and on Lollipop, these UX changes fused with an entire UI overhaul, bringing the pinnacle of Android design to our smartphones; and it was one man’s brilliance that spurred this evolution on – Matias Duarte. Each passing year has seen Duarte’s stature increase considerably, going from a regular designer to a respected figure, and as of late, a revered one, but he remains ever the humble, fun-loving geek at heart. Whether it’s munching (and allegedly being able to subsist) on salami and cheese, strongly advocating women empowerment or enthusiastically connecting with his adherents, Matias does it all on social media, bringing out and fortifying the human element within him and ensuring that he is remembered as a person rather than a set of ideas. It is this set of qualities, coupled with a brazen defiance to push constraints and boundaries and face critics unwaveringly that make Matias an endearing figure, the effect of which is prominent in the recent idolization of his eminence. Like most designers, Matias kickstarted his career as a programmer, starting his journey at Psycroft where he co-wrote the then-popular xBill arcade game, after which he took his first forays into design, filling in the roles of lead designer at Hyper Image Productions and VP of Design at Magic Arts subsequently. Soon after, Matias took on the role of Director of Design at Danger – the company co-founded by Andy Rubin himself before he went on to create Android – and went on to receive the “Industrial Designer” rave award. The year 2005 saw Duarte become the VP of Experience Design at Helio, but the turning point in his career came in 2007, when he was hired as the VP of Palm Inc., the position at which he went on to design webOS and gain a tremendous surge in reputation for introducing features which at the time were light years ahead of anything the world had seen. Post Palm, Matias was recruited by Google as the Director for Android User Experience to specifically work on Android Honeycomb, and quickly cemented his spot by laying down a set of well-defined and doable goals that would revolutionize Android. However, the mobile ecosystem was too premature to immediately implement them, and those goals became long term ones, as Duarte expanded his presence, taking on the role of VP of Design and establishing the formal Google Design team. In the intermediate period between then and the time of realization of those long term goals, the Google Design team led by Matias played a hand in numerous other projects, such as the rebranding of Google’s identity. Once Material Design was announced at Google I/O, advocating and growing the new visual language became the team’s priority, keeping up user research studies and community engagement in the form of feedback sessions and AMAs to ensure that Material Design adapted as time passed, rather than become irrelevant and gradually fade away. When Android Honeycomb launched, it was ill-met on several fronts despite its futuristic look. The tablet-only spec was by itself an off-putting feature, and after being combined with the disruptive and unfamiliar user experience, the results were just short of disastrous. Android Ice Cream Sandwich hit smartphones late in 2011, and was a major step in the right direction, with its once-again familiar user experience combining with Honeycomb’s futuristic look to delight users everywhere. Soon enough, apps subscribing to the Holo principles such as TED, Pocket and Timely began to hit Google Play, thrilling users by their then-beautiful interfaces. Little did the vast majority know that the Android Design team, headed by Matias, had a longer game in mind, and that ICS’s Holo design was just a foreshadowing of things to come, subtly establishing and familiarizing users with patterns like the overflow menu and the navigation drawer, so as to provide a seamless transition to his original vision for the platform, which manifested as Material Design. 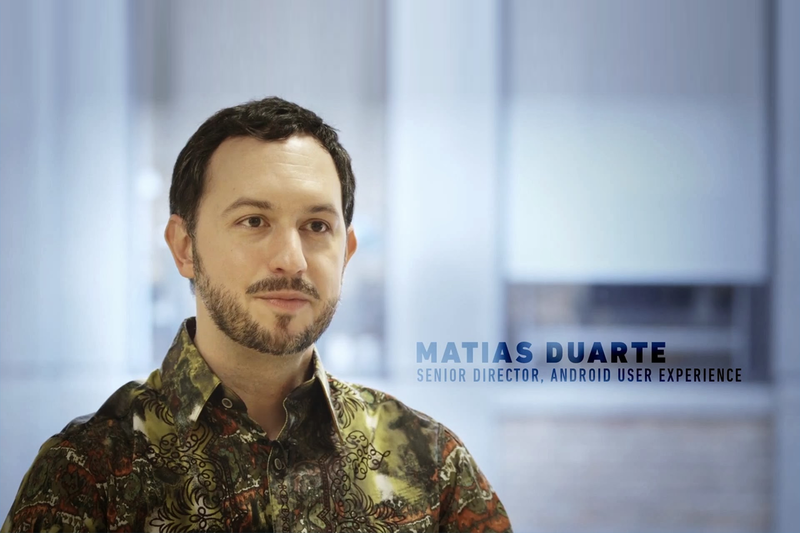 Shortly after the launch of Honeycomb, Matias stated in an interview that despite the major overhaul, Android was only 30% of his vision for the platform. Since then, the Google Design team, with him at the helm, has gone on to establish a number of strong visual identities and branding sets for Google, turn the development-centric company around to make it focus equally on design, and create the most widespread cross-platform visual language in history, with never-before-seen adoption rates. However, when the same question was posed to him earlier this year, Duarte stated that while he’s happy with the progress that’s been made in recent years, he’s “expanding the goalposts” on himself, pushing harder for a world of perfect design. Some points he touched on were a better desktop adaptation of Material Design, accommodation for information-dense presentations, more consistent cross-platform design and universal platform-independent design decisions. It suffices to say, that in spite of almost achieving his vision for design on paper, Matias remains relentless in his pursuit for perfection, ever-increasing the expectations he sets for himself and his team. Matias completed his Bachelors in Computer Science, but also did additional studies in Fine Art and Art History, spending most of his time in painting class.